Single-handed weapons not resembling a straight dagger blade, usually wielded without wrist action; often protects the forearm. Thrusting and slicing weapons for close quarters melee. Col. D.H. Gordon's classification has been used where applicable. Long swords were classified by Gordon as longer than 28 inches/71 cm. Delineated as 20-28 inches/51–71 cm total length. Generally, convex blades used for heavy chopping or slashing. Generally short, concave blades used for heavy cutting. Wielded with one or two hands at close quarters with swinging motions. Wielded mainly with two hands. Primarily for melee with sweeping, thrusting, and/or hooking motions. Thrown spears and javelins are listed under ranged weapons. All could be used as polearm spears, but were designed and primarily used for throwing. Could also be used as axe weapons, but were specifically designed for throwing. 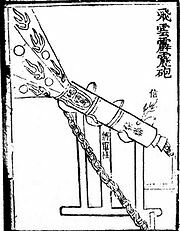 An illustration of an "eruptor," a proto-cannon, from the 14th century Ming Dynasty book Huolongjing. The cannon was capable of firing proto-shells, cast-iron bombs filled with gunpowder. Having a built-in gun or ranged weapon combined with some other type of weapon. Having multiple handles or holdable sections. Having a heavy object attached to a flexible chain or rope. Wielded by swinging, throwing, or projecting the end, as well as wrapping, striking, and blocking with the chain or rope, sometimes attached to another type of weapon. Used not only to block strikes and missiles but also swung outwardly (or in quick upward motions) to strike an opponent. Also used to rush an opponent (known as shield bashing). Some shields had spikes, sharp edges, or other offensive designs. ^ a b c d e f g h i j k l m n o p q r s t u v w x y z aa ab ac ad ae af ag Regan,Paula, ed. (2006). Weapon: A Visual History of Arms and Armor. New York: DK Publishing. ISBN 0-7566-2210-7. ^ a b c Cope, Anne, ed. (1989). Swords and Hilt Weapons. New York: Weidenfeld & Nicolson. p. 8. ISBN 1-55584-290-9. ^ Gordon, Col. D.H. (1953). "Swords, Rapiers and Horse-riders". Antiquity. Antiquity Publications Ltd. 27 (106): 67–76. ^ Levine, Bernard; Gerald Weland. Knives, swords, & daggers. New York: Barnes & Noble. p. 66. ^ Levine, Bernard; Gerald Weland. Knives, swords, & daggers. New York: Barnes & Noble. p. 200. ^ "Igorot Headhunting Axe 2". This page was last edited on 19 April 2019, at 15:17 (UTC).